Are you headed for a hot weather heart attack? While a dose of sunny vitamin D is good for you and exercise even better with its endorphin boost, be sure to practice safe heart health in the heat. Hot summers can induce heart attacks and strokes in individuals who are at risk of heart disease and it’s important to keep our heart safe when the temperatures rise. The heart has to work a lot harder to cool itself off in hot weather. While exercise is the best medicine, it is important to take some important steps to avoid hot weather heart attacks. Be sure your fitness is up to par for the activity you wish to engage in. Work slowly and get your fitness level up over the warm days. Start off small and don’t just jump into big hikes, long bike rides or walks. Not sure if your are out of shape or not? If you can run around the block a couple of times without feeling unreasonably winded, you are probably quite healthy. Your fitness level is a much better way to judge your health than your cholesterol level, blood pressure, or family history of heart or other health problems. Most hearts can go through the hot summers without skipping a beat. But if you have heart disease, heart failure or blockages or are over 45, it becomes important to take proper precautions. Take extra care if you are overweight, especially if you have increased waist size or have diabetes or high blood pressure. Heart and blood pressure medications can increase the body’s response in the heat and interfere with our heat regulation. They may deplete essential electrolytes leading to quicker dehydration, heat stress and blood pressure changes. Dress appropriately, drink plenty of water, do not exercise at the hottest point of the day, and be sure to warm up and cool down from activity well. Wear loose and breathable clothing, a hat, and sunglasses. Dehydration is a big symptom of heat exhaustion. When people experience heat exhaustion, it makes people’s hearts weaker putting them at risk for a heart attack. 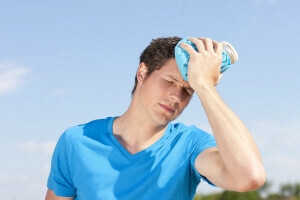 Heat exhaustion can leave people’s hearts weak along with rapid pulses. People can also experience fast and shallow breathing, muscle cramps and/or dizziness and nausea.